A simulated primordial star forming region approximately 200 million years after the Big Bang with two pre-stellar cores of more than five times the mass of the sun each. These cores formed at a separation of 800 times the distance from the Earth to the Sun, and are expected to evolve into a binary star system. 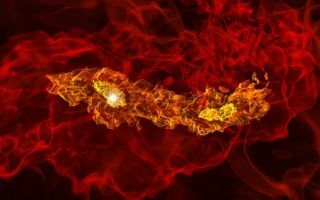 For years,astronomers have thought that the first stars born in the universe formedalone, but new simulation results suggest that some of them may have hadpartners. The firststars began as cold clumps of hydrogen and helium gas that started tocoalesce into stellar embryos. Many of them were huge, astronomers think. Telescopescan't yet peer back far enough in time to see this first generation of stars,but computer simulations can model their formation and tell astronomers whatthey might have looked like. Thesesimulations indicated that these earliest stars would have been whoppers,with masses hundreds of times that of our sun, and would likely have formed insingle-star systems. "Whilebinaries had been proposed, they'd never been seen in cosmologicalsimulations," said Matthew Turk, a graduate student at Stanford University who ran the new simulations. Binary andeven triplestar systems are common in the more modern universe, and they are typicallymuch less massive than early-generation stars. In the newsimulations, Turk and his colleagues ? Tom Abel, also of Stanford, and BrianO'Shea of Michigan State University ? included more precise information tobetter mimic the conditions thought to have existed in the early universe. When theyran the simulation, they got what Turk called a "rather surprisingresult": They saw indications of fragmentation in the gas clouds thatsuggested the formation of a binary star system. "Whenwe started the simulation, we didn't know it was going to form a binary,"Turk told SPACE.com. Just howmany early stars might have been binaries isn't clear yet ? determining theirabundance will take many more simulations. "Theidea here is that it's not forbidden, that it seems like [the stars] formalone, but sometimes they might have some friends, they might form inpairs," Turk said. Thefinding, detailed in the July 10 issue of the journal Science, alsojibes with observations of very old, low mass stars in the halo of the MilkyWay, O'Shea said. These earlystars and galaxies later merged to form today's galaxies [, such as our ownMilky Way. By observing them and analyzing their compositions, astronomerscan estimate the average masses of the earliest stars, O'Shea explained. Theestimates from this method suggested that the first stars weren't quite asmassive as expected, with the average falling around 30 to 40 solar masses. The newsimulations explain the discrepancy between the massive stars seen insimulations and the estimates of much smaller masses: "Instead of one bigstar, you get two smaller stars," O'Shea told SPACE.com. The findingthat early stars might have been binaries could have implications for thedetection of gamma ray bursts in the early universe. Theseenergetic explosions are thought to occur when a massive star rotates very fastand then collapses. The doomed stars are spun up by companion stars that stripoff their partner's outer layers. Havingbinaries in the early universe suggests that gamma ray bursts also occurredearly on. When NASA's James Webb Telescope is launched into spacein 2013, itwill be able to peer further back into the universe's past than any othertelescope, and should be able to see the supernovas that go along with thegamma ray bursts, O'Shea said. Theexistence of early binaries could also have implications for the detection ofelusive gravitywaves, disturbances predicted by general relativity. Gravitywaves from single black holes are difficult to detect above normal noise ? topick up the signal ? assuming any exist ? astronomers need a dynamic, evolvingsystem, which is just what a pair of black holes would provide. The teamplans to do more simulations to get a better picture of just how common binarystar systems might have been in the early universe and what the likely massesof these stars might have been.